Regular players at WinADay.com know that when the progressive jackpot gets as close to $200,000 as it was last week it can’t be long before it’s hit. And sure enough, it was! A film student won more than enough to pay off his student loans when he won $200,859 playing the site’s popular video poker game, Jack’s Show. This is the second highest win ever at WinADay.com, the largest being the $223,420 jackpot won by a retired widower playing the Reel De Luxe slot machine in March. Before these last two wins, the WinADay jackpot was usually hit every six weeks for $100,000 to $150,000. If these last two jackpots are any indication, bigger jackpots hit more frequently could become the norm. After adding a new game every month for the last few months the unique online casino now has 15 one-of-a-kind games: nine slot machines, four video poker games and Roulette 5 which combines slots fun with the thrills of Roulette. All games are instant-play so there’s no downloading or installation required. 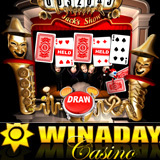 The Jack’s Show is one of the games that WinADay first launched with. Animated jesters frolic across the screen dealing cards and perform special antics for winning hands. The object of the game is to obtain the best poker hand possible. Players can wager from $1 to $25 per hand. This month WinADay’s Game of the Month is the Slot-O-Matic. Everyone that plays it is automatically entered in a draw for $500 in prize money and a chance to win a Dell Studio 15 laptop in a year-end draw.